Neuronal Ceroid Lipofuscinosis 8 (Setter Type) is a lysosomal storage disease affecting English Setters. Affected dogs lack a specific Enzyme necessary for normal metabolism. As a result, there is an abnormal accumulation of waste compounds primarily in the cells of the nervous system, leading to a range of nervous system disorders. Affected dogs typically present with mental dullness between 14 to 18 months of age. Progressive loss of vision, lack of muscle coordination and an abnormally stiff gait are noticed shortly thereafter. Within a few months of disease onset, seizures begin and are often the cause of death in an affected dog. Death or euthanasia usually occurs by 2 years of age. The Mutation of the CNL8 gene associated with neuronal ceroid lipofuscinosis 8 has been identified in English Setters, although its overall frequency in this breed is unknown. Genetic testing of the CNL8 gene in English Setters will reliably determine whether a dog is a genetic Carrier of neuronal ceroid lipofuscinosis 8. 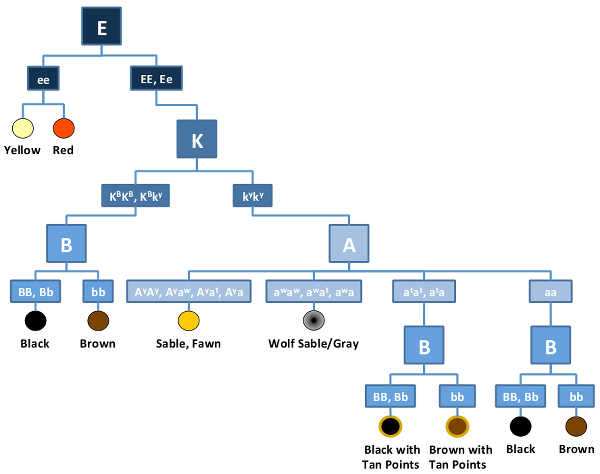 Neuronal Ceroid Lipofuscinosis 8 (Setter Type) is inherited in an Autosomal Recessive manner in dogs meaning that they must receive two copies of the mutated gene (one from each parent) to develop the disease. In general, carrier dogs do not have features of the disease but when bred with another carrier of the same Mutation, there is a risk of having affected pups. Each pup that is born to this pairing has a 25% chance of inheriting the disease and a 50% chance of inheriting one copy and being a carrier of the CNL8 gene mutation. Reliable genetic testing is important for determining breeding practices. In order to eliminate this mutation from breeding lines and to avoid the potential of producing affected pups, breeding of known carriers to each other is not recommended. English Setters that are not carriers of the mutation have no increased risk of having affected pups.